We love working with small business owners, especially cafes and coffee shops. From Seattle to New York City, we serve hundreds of coffee havens. These business owners love using our service to engage customers, increase foot traffic, and bottom line? Encourage sales. At the end of the day, that’s what we’re all working towards, right? Growing our business, satisfying customers, and as a whole increasing brand loyalty. Well guess what? Our service can help you check all three of these tasks off your list. 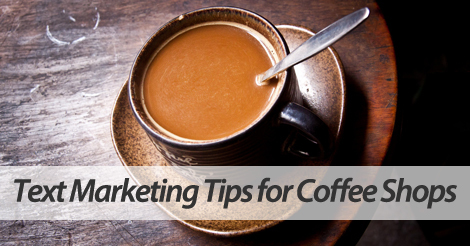 Want to learn more about text message marketing for coffee shops? Get started by following these campaign ideas below. Launching an awesome punch card program? Spread the word with one single mass text message. Punch cards are in! Stop down to get yours, and show this text for two free punches. People can’t resist mobile offers. Fire out irresistible drink specials, and watch as foot traffic increases. We’re trying a new dark roast blend! Stop down today and show this text for one free small cup. Hosting some afternoon acoustic? How about an open mic night? Alert cafe patrons with one simple text message. Stop down tonight from 8-10PM for open mic night! Spots fill up quick, sign ups start at 715PM. Partner up with the best text message marketing service, SlickText.com. Give us a buzz at 1.800.688.6290 to learn more, or head over to the pricing page and sign up for a free plan. Our feature rich platform caters to the small business owner that wants affordable results using an innovative service. We put time into every single one of our educational resources, and make sure they’re easy to read, easy to understand, and easy to follow. Don’t hesitate to contact us if you have any questions or concerns.